CLICK HERE for the cable TV channel line up. ﻿Use the XFINITY remotes to change channels on the TVs. They also should turn on the TV and adjust volume. Use the TV remotes only to change the input or source for the DVD players (and the Chromecast in the living room). Should the TV's tuner channel get turned off of channel 3, you will not be able to receive cable channels. You would need to use the TV remote to put the TV channel back on 3. CHROMECAST for Netflix, Your TIVO via Sling, etc..: We have a CHROMECAST in the living room. Using the Vizo remote, turn the TV on and then press the input button. Select HDMI 1, which reads CHROMECAST. Next, use your smart phone and make sure it is connected to our WIFI network (CRAIG 408E). Then simply use the Netflix or other app on your phone. You will see in the upper right a symbol that looks like a "radar bing" for a lack of a better description. Press it. Then select "Chromecast 408E" on your phone and the display will transfer to the TV! Many, many apps on your phone are Chromecast ready. Just look for the symbol that I mentioned. Regarding the internet: a password will be provided to you. There are numerous WIFI networks. Most all will have the same password that has been provided. You can use the network marked with the numbers 408 or any other network for that matter. In the event you have no hot water when you arrive, simply wait 30 minutes. We have a system that turns the hot water heater off when the unit is empty for an extended period of time. Once you arrive, motion detectors reactivate the hot water heater and it should be plenty warm after 30 minutes. Should you need to iron anything, you should find an iron in the cabinet above the washer. A pull down ironing board is behind the laundry room door. We have a crock pot cookbook should you wish to eat in. Please leave the cookbook in the unit. We have an energy efficient system in the unit. 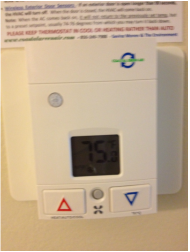 We also have a very easy thermostat to use. Simply press the red triangle to increase the temperature setting or the blue triangle to lower the temperature setting. Please do not leave the balcony doors open for extended periods. Due to high humidity, it is hard on the furniture. The air conditioning unit will automatically turn off when the doors are left open for more than 90 seconds. Once the doors are closed, normal operation of the air conditioning unit will resume. The fan setting is at "auto" which is displayed on the screen. The AC itself should be on either cool or heat, but not auto. That is not the setting on the screen. You will find that setting switch under the red triangle. In the warm months, it should already be on the cool setting. So you will not have to change it. PLEASE MAKE SURE THE REFRIGERATOR’S TEMPERATURE SETTING IS NOT AT ITS COLDEST SETTING. According to a technician that actually makes it NOT work as well. Both the freezer and refrigerator setting should be near the middle. You should find the refrigerator empty when you arrive. When you add room temperature items, it takes a while for the refrigerator to get all of them cold. Also make sure no item you add is blocking the damper from the freezer to the refrigerator near the back of the refrigerator. 2. Take off the bed linens and place them and dirty towels, etc. on the floor by the washing machine, but do not put them in the washing machine.